This recipe is from the Fat Smash Diet book, suitable for Phase I of this program, or any time as a healthy choice salad. I prepared it for my second week of Phase I, with some minor modifications. It is on a tangy side, due to the required amount of lemon juice, but also quite refreshing. 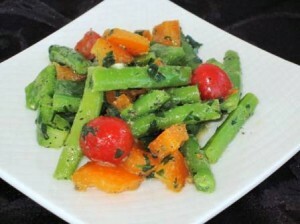 Great as a snack between meals, or as a side dish with veggie burger, or brown rice. I usually flavor my brown rice with sauteed onions, salt and pepper. Wash green beans thoroughly. Trim off at both ends. Boil 4 cup of water. Add beans to boiling water, and cook about 4 minutes. Drain off water, and let the beans cool. Rinse the other vegetables, and pat dry. Cut the cherry tomatoes in half, and set aside. Chop the orange and green peppers. Place all chopped vegetables in a medium bowl, add parsley and garlic. Pour the prepared vinaigrette over vegetables, toss gently. Cover and chill in the refrigerator for at least an hour ( I liked it better the next day, since the flavors had a chance to blend well together). In a small bowl, combine mustard, oil, and lemon juice. Cover, and shake well, to mix together. Add onion powder, basil, salt and, and shake again to mix it well.